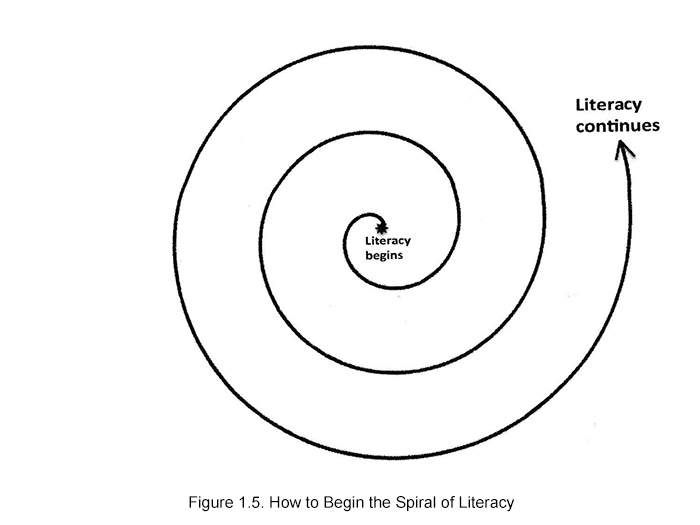 The Spiral of Literacy (Wink & Wink, 2004) is an activity designed to focus on our own path to literacy. The purpose of the following reflective activity is to assist us in understanding our own literacy development and that of others. This process works with all age groups. Adults will often initially say that they have no memories that far back; at this point in the process, the lead person needs to maintain the focus on a quiet, reflective environment, and I promise you that memories will come back: Some will experience an a-ha moment, and it is not unusual to see a tear or two fall down a cheek. Not all people have happy literacy memories. Some will realize that they learned sight words first; others used phonics and to build it all of up from its parts. Still others will only know they were reading when they began Kindergarten, but they will have memories of being read to and memories of specific books. This process is also very helpful in understanding the literacy development of students who are still in the process of acquiring English; it can be very revealing for teachers, librarians, students, families—for all who focus on literacy development. To begin, you only need to draw a spiral on a chalkboard, whiteboard, butcher paper, or use a data projector (see Figure 1.5). 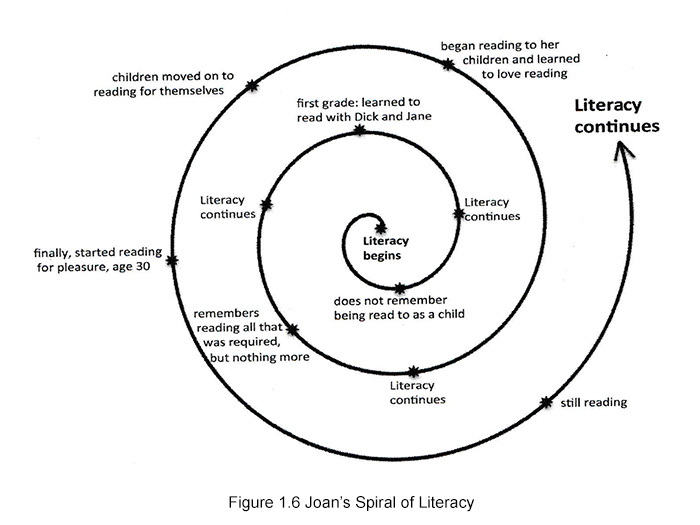 In addition, you may download a spiral at http://www.joanwink.com/wp-content/uploads/2016/10/spiral-of-literacy.jpg. 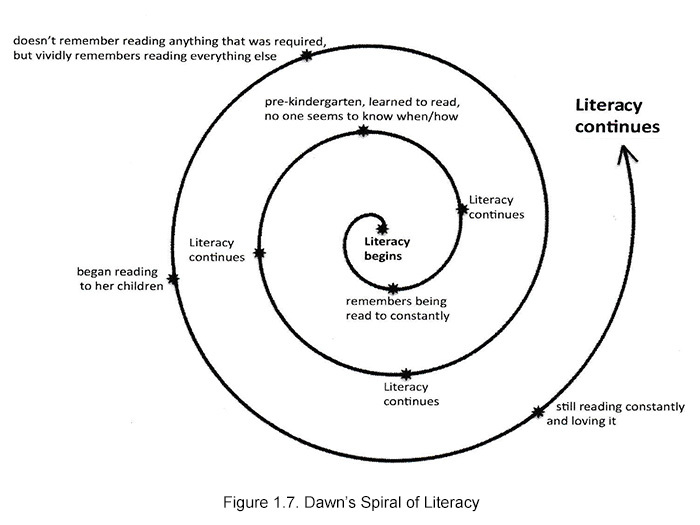 You may also see the YouTube version of the spiral of literacy here: https://www.youtube.com/watch?v=yMJFaSe5rWQ&feature=youtu.be. It doesn’t matter, but you do need an image of a spiral. The purpose of the spiral is two-fold: First, a spiral provides something solid to grasp, as we reflect; and second, the spiral demonstrates the continuum of learning and developing. For example, I reflected on my own literacy development (see Figure 1.6), and our daughter, Dawn, also reflected on her memories of literacy (see Figure 1.7). You will note very different paths to literacy in our family. The previous two spirals of literacy development are unique; our daughter and I learned to read in vastly different ways. Drawing these literacy spirals made us reflect more on the many paths to literacy. This activity also provides a hint of where this book will take the readers.